The colors and spectrum of Modern Workshop lend themselves nicely to this simple strip quilt that I created for Moda. I had lots of fun designing it, and it’s a good project for someone who is new to quilting or wants a pattern that doesn’t take a lot of time. By staggering the pieced strips, the over-all pattern has an ombre effect, as you can see in the photo. The quilt requires one Modern Workshop Jelly Roll and additional fabric for the background and the backing. You can download the free project sheet for this quilt from either the Moda website or from our website. I hope you enjoy making it. I love it! It’s so colorful, and perfect for a kid’s room! What size is the completed quilt? 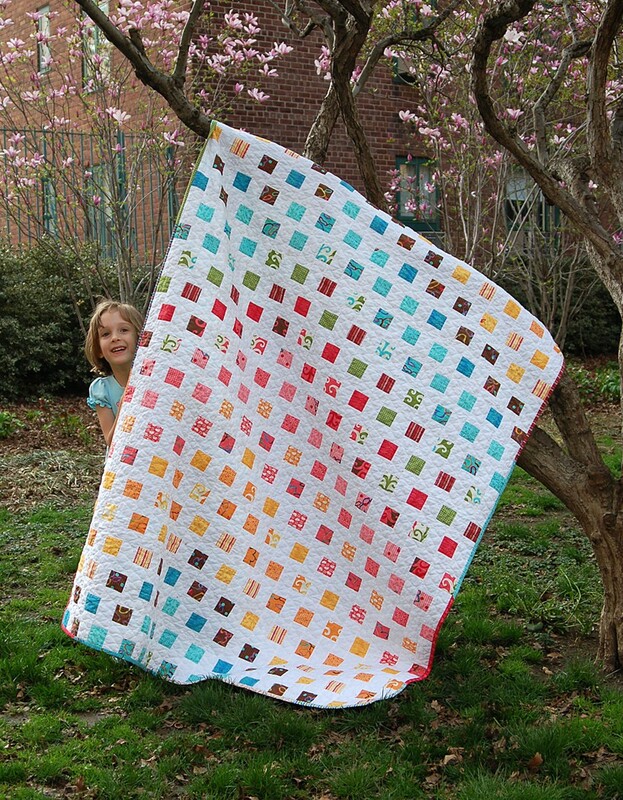 This quilt is so fresh and cheerful. Perfect for the ‘modern kid’s’ room! I love how all the white makes those tiny squares of colour just POP!!! I saw this at the quilt store on a brochure about the fabric line and your story. I loved it and they had all the fabric line at the store. They are so girly, my 10 year old daughter wanted some of each color like in the quilt. This link for the pattern no longer works. Is it still available? I just checked, and both links work and provide the PDF. Why don’t you try again. Trying for my first quilt and this looks great, pretty AND easy! Thanks!